2016 | University of Chicago-Neubauer Collegium for Culture and Society & Smart Museum of Art, "Fantastic Architecture: Vostell, Fluxus, and the Built Environment" and "Vostell Concrete, 1969–1973"
Katarina Burin, view of Hotel Nord-Sud, 1932–34: Design and Correspondence, ICA Boston, 2013. Photo: John Kennard. This exhibition presents a body of work attributed to the Czechoslovakian architect Petra Andrejova-Molnár, an overlooked (in fact, fictional) figure active in Eastern and Central Europe during the first half of the twentieth century. 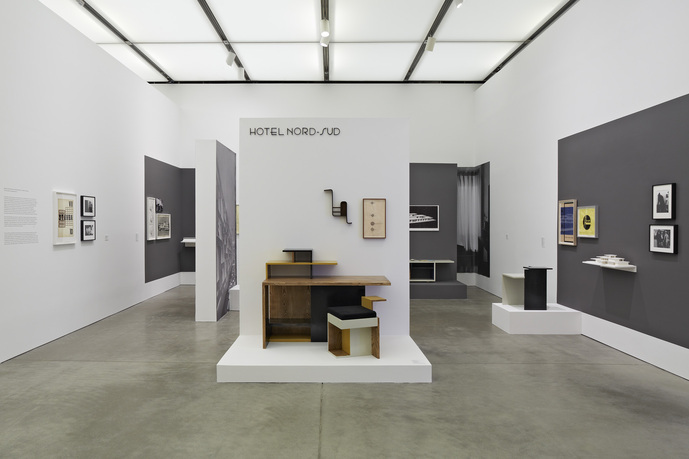 The exhibition presents a diverse range of materials: including architectural models, drawings, furniture and design objects, staged photographs, and biographical texts. 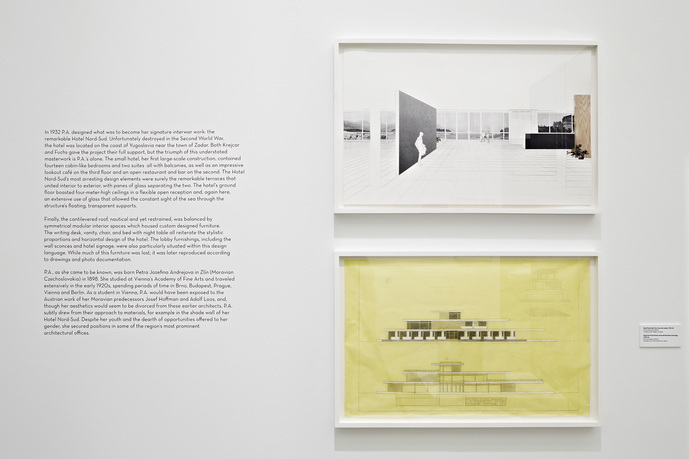 In generating Andrejova-Molnár's work, and the scholarly apparatus around it, American artist Katarina Burin simultaneously inserts her into and subtly destabilizes the established canon of architectural history—lending voice to female designers, while also questioning notions of authorship and authenticity, the relationship between gender and the archive, and the historical tension between national identity and internationalist aspiration. 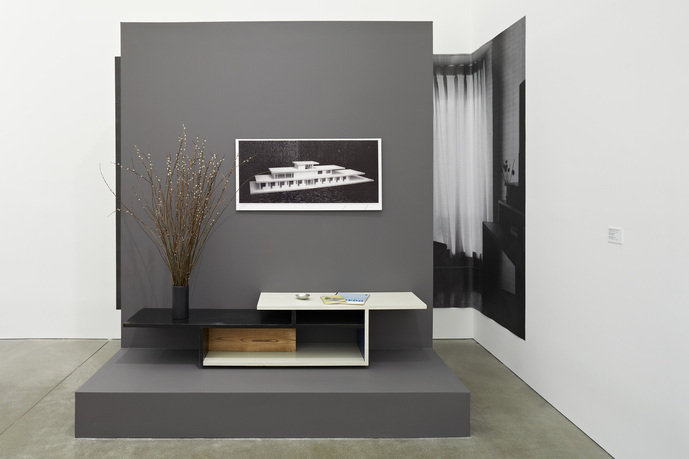 The project both demonstrates how historical movements and utopian ideologies are complicated and contradictory formations in a constant state of flux, while also creating a space of play around the mythos of "the architect." Katarina Burin's recent solo exhibitions include the Kunstverein Langenhagen; Akademie Schloss Solitude, Stuttgart; Ratio 3, San Francisco; and P!, New York. She has participated in group exhibitions at venues including the Aspen Art Museum; White Columns and Participant Inc., New York; the ICA Boston; and Galerie Max Hetzler, Berlin. 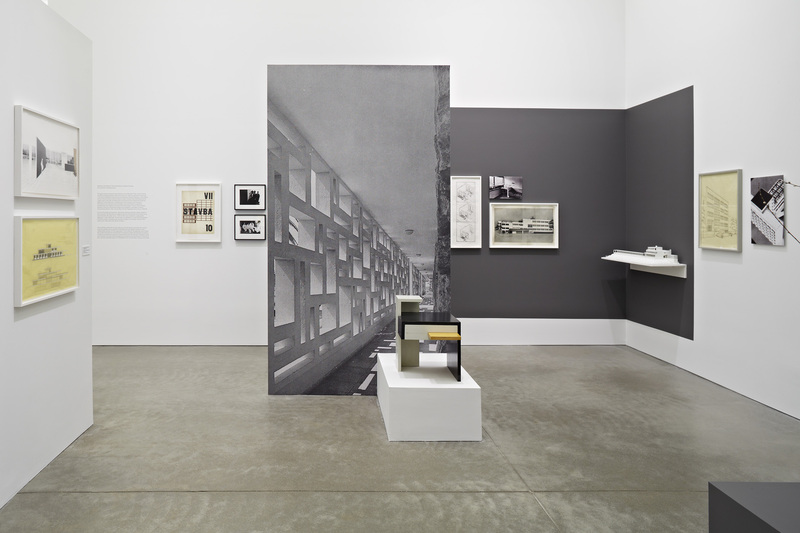 Burin cocurated the exhibition Brute at Harvard University's Carpenter Center for the Visual Arts and an exhibition at Institut im Glaspavillon, Berlin. Burin earned her MFA from Yale University and her BFA from University of Georgia. Among her awards are the Dedalus Master of Fine Arts Fellowship, as well as fellowships and residencies at Akademie Schloss Solitude, Stuttgart; MuseumsQuartier Vienna; Skowhegan; Yaddo; and the MacDowell Colony. She was the recipient of the 2013 James and Audrey Foster Prize from the ICA Boston. She is currently a lecturer in visual and environmental studies at Harvard University. Jacob Proctor directs arts and media programming at the Neubauer Collegium and teaches contemporary art and criticism at the University of Chicago. After studying the history of art and architecture at Harvard, he was a curator at the University of Michigan’s Museum of Art (2007­–11)—where he began the exhibition series UMMA Projects—and the Aspen Art Museum (2011–14), where he organized solo exhibitions and publications with Rosemarie Trockel, Thea Djordjadze, Simon Denny, and Morgan Fisher, among others. His writing appears regularly in Artforum and numerous exhibition catalogues. Founded in 2012, the Neubauer Collegium supports innovative collaborative research projects of University of Chicago faculty, while pioneering efforts to engage a wider public in humanistic scholarship. Launched in April 2015, Neubauer Collegium Exhibitions integrate the visual arts and material culture into the intellectual program of the Neubauer Collegium, developing new models for the presentation of both historical and contemporary art in the context of the research university.